In 2017 Nigel Lowis produced one of the best compilation soul albums ever, DSG Volume 1, it spent 8 weeks at the #1 spot which extended it’s CD demand right through until today. Having kept you waiting a good eighteen months to introduce Volume II. It is with pleasure that we present to you a timeless collection of 19 new songs that you will love and treasure for the rest of your life. If you go through the wardrobe of Nigel Lowis, you will not only find Tweed jackets and designer shirts but unreleased gems from musical giants. The Genius of Nigel Lowis will change your mood with his uplifting hands in the air type anthems, classy Philly styled gems and romantic ballads. Nigel gets his influence from many parts of the world such as Memphis, Philly, Detroit, London, Prague, & New York. Brought up in Brixton with the sound systems of yesteryear be it Street Soul, PIR, Reggae or Motown, Nigel has the ear to be able to pick up a guitar and groove, you just cannot help but to groove along too. Just how many other producers can cover a Chic production, put their slant on it and have a crossover top 10 hit as he did with Maureen Walsh for Polydor. Nigel has worked with Dina Carroll, Eternal, Be Be Winans, Stevie Wonder, Luther Vandross, Burt Bacharach and many other huge greats from the ‘who’s who’ in the music industry although Lowis is not one for shouting about it, but if a name like Lamont Dozier crops up in conversion, he will add “Oh I wrote a song with him”. The Story of DSG started with SouLutions so it is fantastic that they have allowed us to revisit ‘Philly Line” with a first-time Nigel Lowis mix, the song has been re-vocalised and reproduced to give it a completely new Philly vibed up version for 2019. Paul Reid (Nightcrawler’s), Steven Dante and Rebekah Ryan were in the Lowis wardrobe of classics songs that only he and they knew about, the songs are suited and re-booted giving them a crisp edge for today’s ears. The first single from the new DSG Nigel Lowis Vol 2 CD album is Kenny Thomas‘s wife Francisca Thomas, who was born in Cape Town in 1982. She came from a very musical family and was singing from a very early age, in fact her first TV appearance was in South Africa when she was only 8 years old! She has performed in several groups along with her sisters, travelling all over South Africa doing shows. In 2003 she was a finalist in pop idol in South Africa and went onto signing a deal with EMI records. In 2007 she visited the UK to do some gigs, on one of these gigs in Cheshire, she met Kenny, they were were both performing on the same bill that evening, the rest as they say is history, marriage, kids, Housework, which to a degree prevented her from getting on with her music, but she still managed to write songs for Kenny, along with other artists and do some recordings herself. She hopes to be able to record more material in the coming months. Clouds In My Mirror’ was written by the talented Francisca and co-produced by Nigel Lowis who gave the song it’s Memphis feel. Kenny Thomas – ‘Back On Broadway’ was first written with George Benson in mind, Thomas loved the track and was really up for recording the song, with maybe some Benson licks forthcoming in the future. Teddy B was first spotted by Mark Franklin singing on-line, his details were passed to Gary Van den Bussche who then helped him promote his first couple of sides to then suggesting he cut a track with Nigel Lowis. Lowis just happened to have the perfect song that Teddy B helped him finish for the CD. Peter Symporien – originally featured on DSG Volume 1 CD, but is now featured here with the cool Fitzroy Facey in a Norman Whitfield nod to cool grooviness, that at first might sound different but the more you hear it the more you’ll be replaying. Watch out for dance mixes of this soon! Peter Symporien, Marc Staggers, Roger Samuels (fresh from The Voice), Hannah White, Jimmy Gallagher and Lowis Nigel aka The Soul City People, originally a whole album project idea almost like Louis Vega’s NuYorker Soul, but many of the tracks have now been released on DSG or featured remain in the wardrobe for another time. 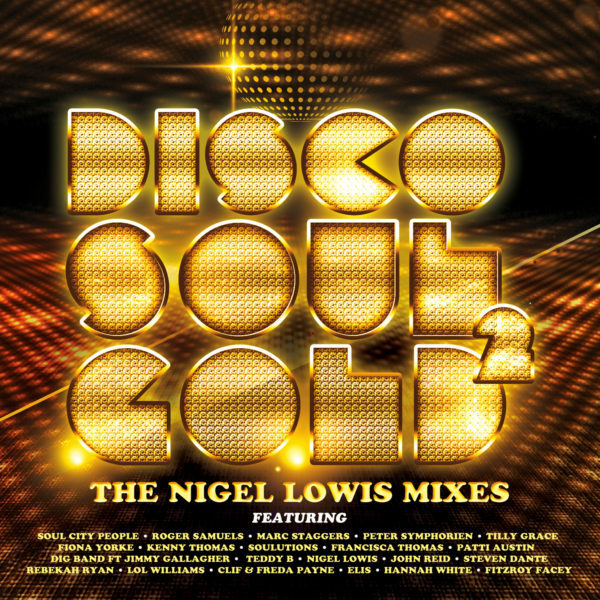 Soul City People track was written by Nigel Lowis & Ola Onabule. Lol Williams is a singer that Gary Spence discovered when he saw him singing live which lead to the original version becoming a favourite on his Solar Radio show. Nigel Lowis The Artist features for the first time here as a soloist in his own right and who knows, maybe an album to follow if this track is well received. Elis … This is a first & we are proud to present Elis. The song was co-written by Lowis, David Morales & Elis with Patti Labelle in mind . Nigel is currently working on Elis’s forthcoming album project overseas where she is signed to a major label, they thought it would be great to give you all a preview of this great ladies talents. Clif & Freda Payne follow their #1 smash ‘No Payne, No Gain’ with ‘Yesterdays Payne, Tomorrow Joy’, now with a Thom Bell influenced arrangement, that Bell even thumbed up himself when he heard it, the version that was on Clif’s album last year was not the finished mix, so here it is for the first time. Fiona Yorke – Love For Me was a runaway #1 Gospel/ R&B hit and although played on soul radio in the UK, we felt this new mix would give the song another chance with it’s new exciting direction. Tilly Grace the youngest, so no doubt the hippest member of the DSG family, takes time out from recording her follow up to ‘Ghetto Superstar’ with a song she originally recorded as a jingle for the BBC Soul show. Hannah White sounds completely at home and snug with this co-written Burt Bacharach styled lush vintage classic ‘Tell Me’. Marc Staggers who we all know and love, sings one of the finest ballads of the year, which is Timeless for sure. I hope that you enjoy the new DSG Volume 2 CD, 19 timeless tracks that you will enjoy playing for many years to come. It’s a shame Nigel’s jackets didn’t fit me or I might have taken those too HA!! IN STOCK – END OF APRIL 2019 – Pre-Order your copy now for delivery as soon as they arrive.